Cleo Mussi – Dig Delve – An online magazine about gardens, landscape, growing & making. 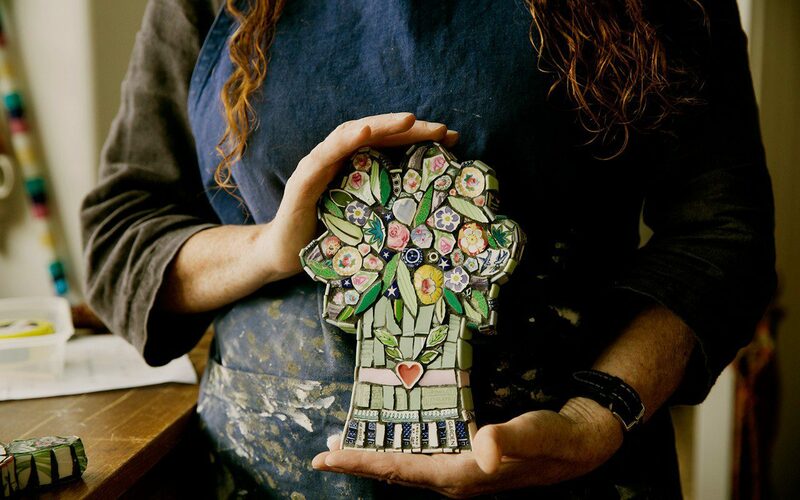 Cleo Mussi is a mosaic artist who worked with Dan on one of his first Chelsea Flower Show gardens in 1993. Her work is concerned with the influence and importance of nature, man’s place in the ecosystem and the effect we have on it through such practices as intensive agriculture and genetic modification. 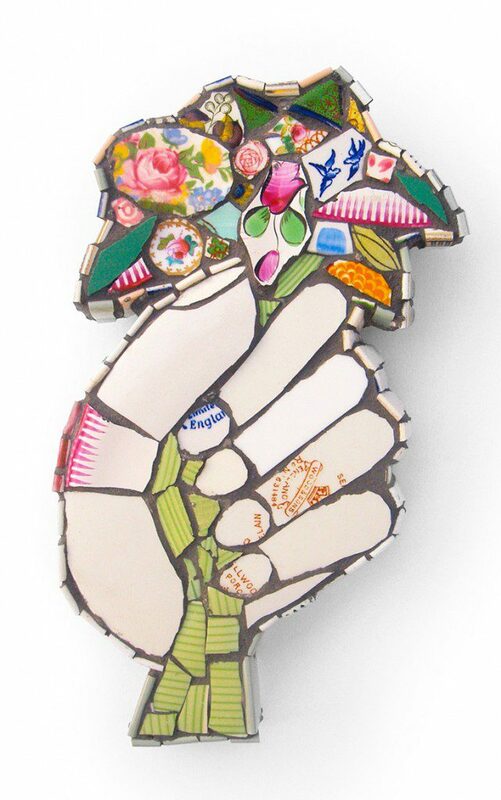 She brings a critical, politicised and humorous eye to an old folk art tradition. You originally studied textiles at Goldsmiths. 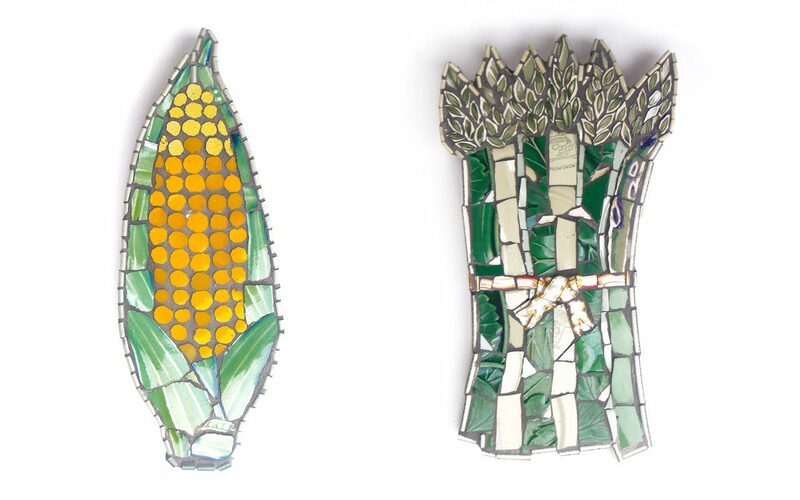 Can you tell me how you arrived at working with mosaic and the connections between these different materials ? In the late 1980’s I was creating wall pieces using a number of textile processes, printing, weaving and patching together found (essentially affordable) fabrics. Charity shops, car boots and skips were an Aladdins’ cave. I was also studying ceramics at night school. 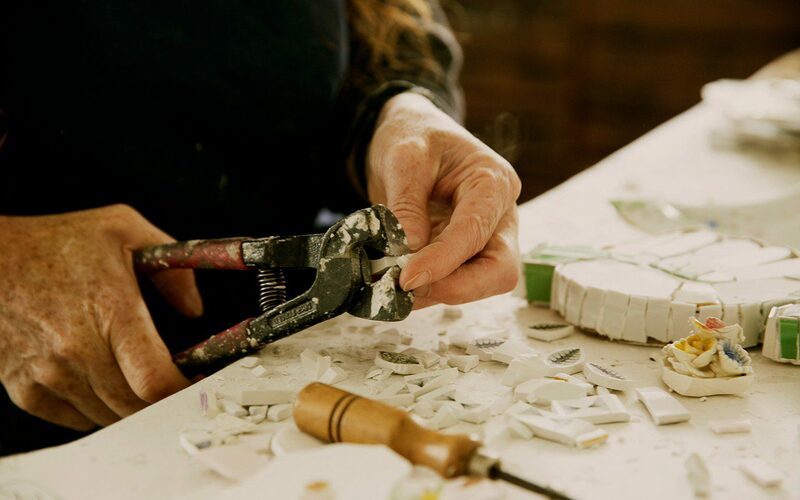 When I left college I began to explore mosaic as a technique and taught myself through trial and error. 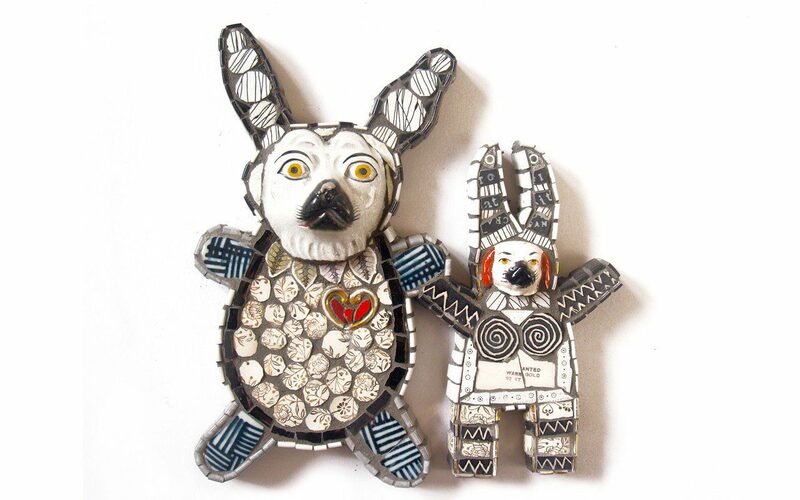 My work is created from second hand table-ware and ornaments patched and pieced together as with the textile tradition. Originally I wanted to make durable artworks that could be created for both interior and exterior spaces though, due to our climate, very low fired ceramic is not suitable for outside, so all my pieces are interior now. You worked with Dan on one of his early Chelsea Flower Show gardens. How has the market for your work changed since then ? My work has evolved very slowly over the years. 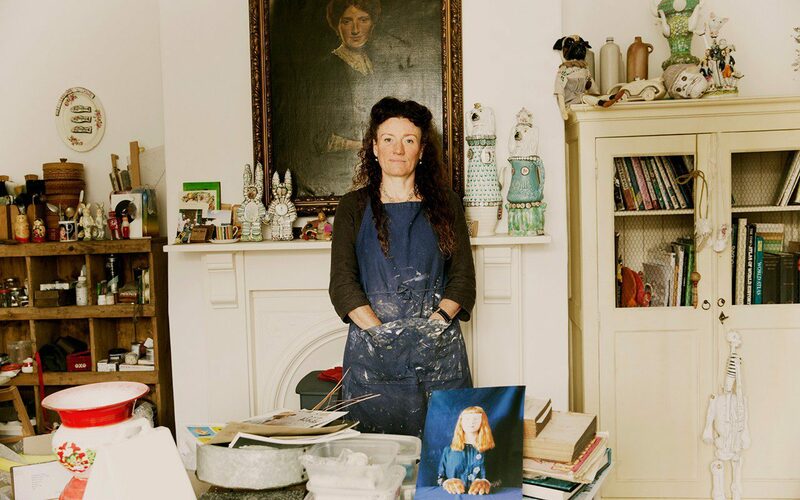 When I left college, my contemporaries – the YBA’s from Goldsmiths – were having their first Frieze show and I was making hundreds of tiles and glass mounted works, some of which I exhibited in an architect’s office on Brick Lane and also in an empty shop in Hoxton. I had a studio on the Old Kent Road and then later at the South Bank. In 1992 I was lucky to be accepted for a show at the Royal Festival Hall called ‘Salvaged’ and was then offered a subsidised studio. It was a fantastic space full of makers working in a variety of disciplines inspiring and helping each other. I think it may have been the ‘Salvaged’ exhibition and subsequent press coverage that introduced Dan to my work. 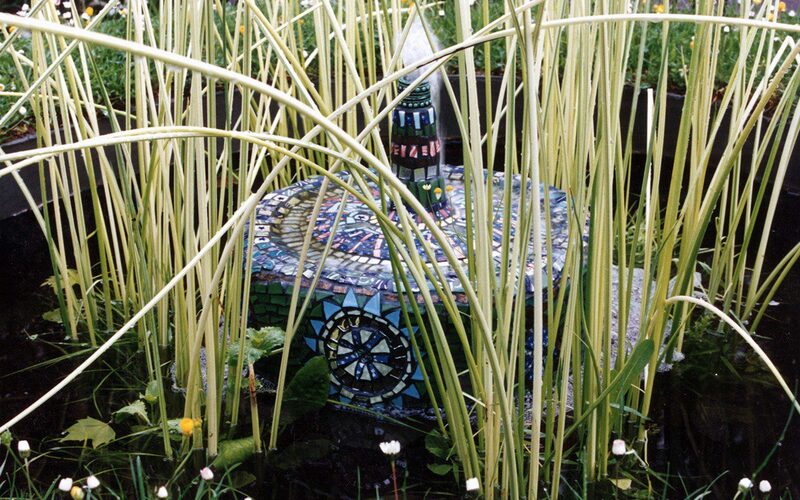 It was Dan’s second Chelsea garden, very vibrant and rich with intense colour, and I think the mosaic complemented the planting. It was a real education seeing him create and plan a show garden and being on site during the event. I still have a number of plants that he gave me when he dismantled the garden and they remind me of that time. Plants, like china, hold memories and connect to people and events. Since then my work has evolved in that my projects are more ambitious and my work is more refined in the making and the conception of the ideas. 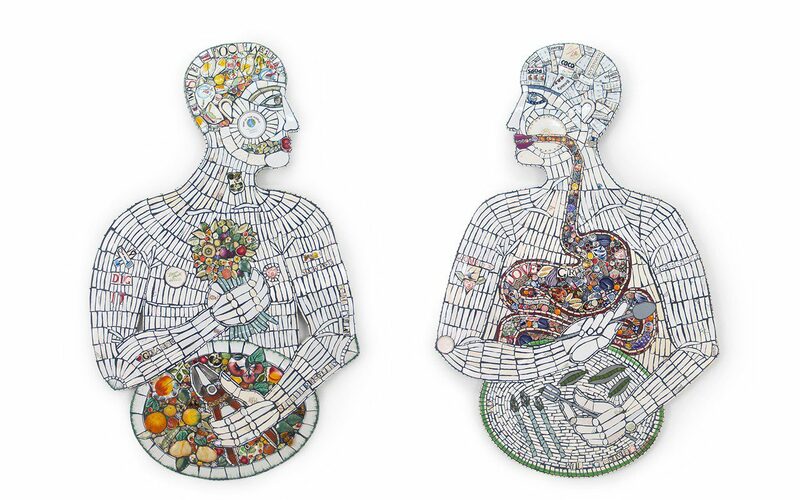 I create large installations of up to 90 mosaics for new touring shows on grand themes that I am passionate about. 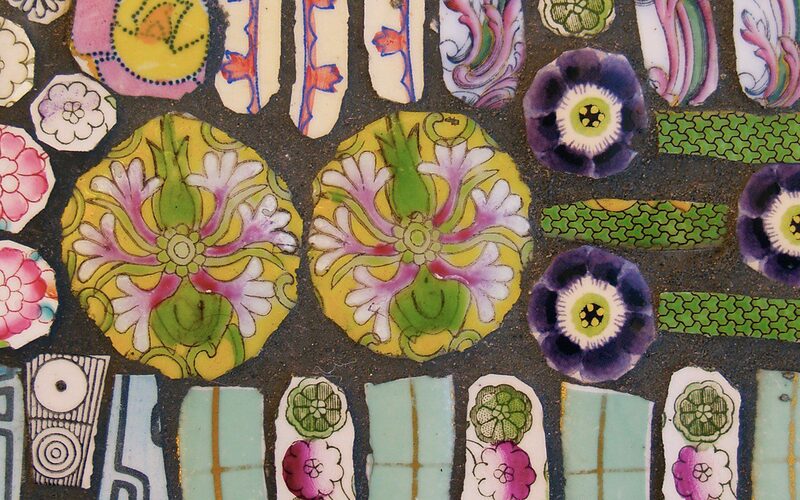 Interestingly my clients are still the same sort of people, individuals and establishments that love the work for what it is, for what it is made from and the inherent properties in the china, for the memories they revive, and for the stories that I tell. Nature is clearly a very important theme in your work, and I know that you are a keen gardener. 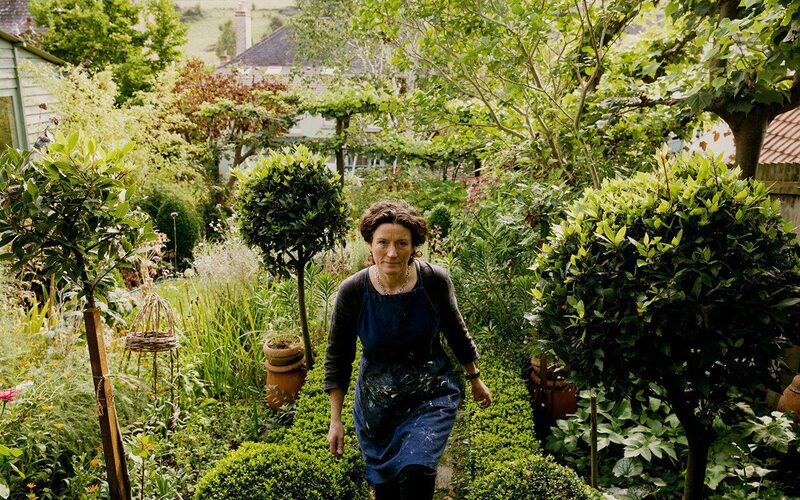 How do nature, gardens and plants inspire your work ? I had my own small patch as a child and gathered euphorbia milk and strawberries for my dolls. At an early age my mother taught me about plants; that rue can cause blisters due to photo-allergy and that monkshood is deadly. My mother loved and feared plants. My parents’ oldest friend was Roger Phillips the photographer, ‘Wild Food’ author and mushroom hunter, so this was all part of my childhood. And that Darwin ruled, OK ! My father was an engineer, which is why I love structures and cause and effect and my mother was a human biology teacher, Naturopath and keen gardener. Plants were to be respected, but entice us to take advantage of them to keep the species alive and they in turn take advantage of man. I collect plants like old china, gathered at every opportunity, divided, seeds collected, cuttings taken for my own garden and lovely meals made from produce either grown or from the hedgerow. 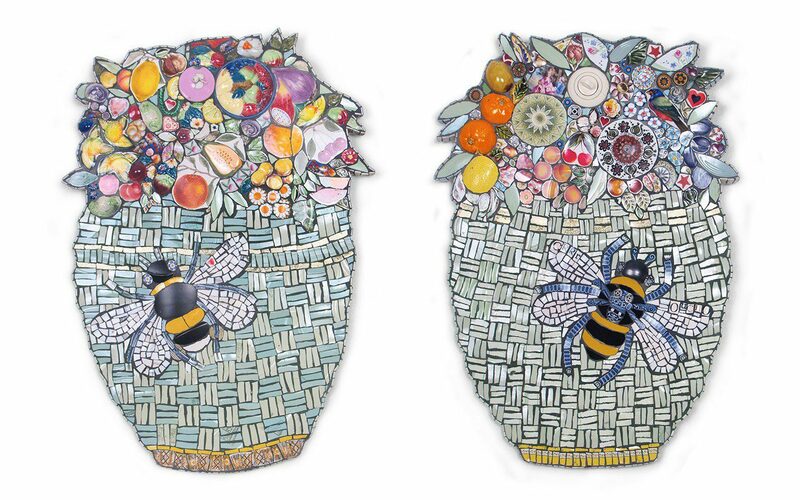 Large Collector’s Baskets with Bees, 2014. Photograph courtesy Cleo Mussi. Bouquet, 2005. Photograph courtesy Cleo Mussi. Can you tell me about your recent conceptual shows ‘Pharma’s Market’ and ‘All Consuming’, the themes you explored through them both and why they are important to you ? These exhibitions connected ideas about food, agriculture and animal husbandry with modern developments in stem cell research, genetic modification and alternative energy. I am intrigued by evolution from the microbial soup in sea vents to archaea, bacteria, viruses, plants and animals; the physical details, the names and the stories and connections on the cellular level. These exhibitions explored the history, the characters, plant hunters, collectors and science. I observe man’s destruction and consumption of natural resources and the impact on our environment, whilst being inspired at the creativity and imagination to solve problems. For example, most recently the discovery of mycelium that neutralise toxins in toxic waste or that bind clean plant waste to form biodegradable packaging, or fungi that help in cancer research. More recently I have become interested in cyborgs and biophysics as well as in the Human Brain Project, the Human Genome Project and, of course, the microbiome; the little gardens in our own bodies yet to be discovered. Monoculture Perfection, 2014. Photographs courtesy Cleo Mussi. How has your work changed and developed since you first started ? 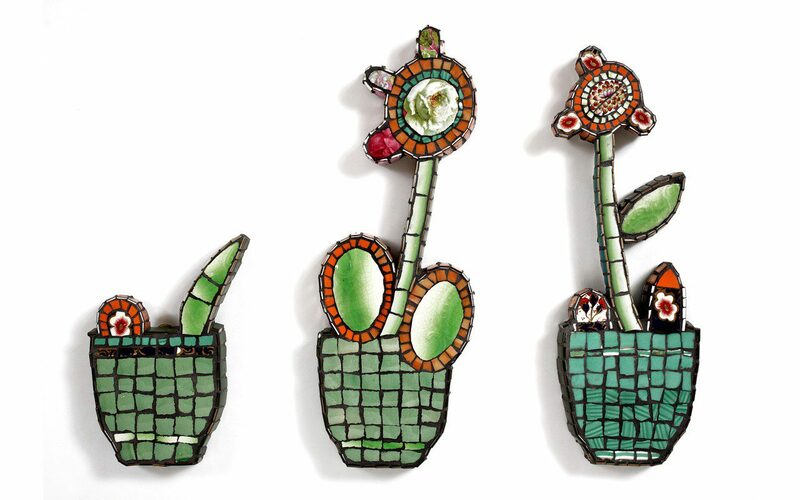 When I first started making mosaics, my work was quite simple: tiles, tables, abstract wall panels, naïve faces and fountains for conservatories and gardens, I contributed to many gardening and craft books. Currently my work is generally exhibition focused with a number of commissions alongside mainly for private individuals, but also for arts centres and hospitals and businesses. 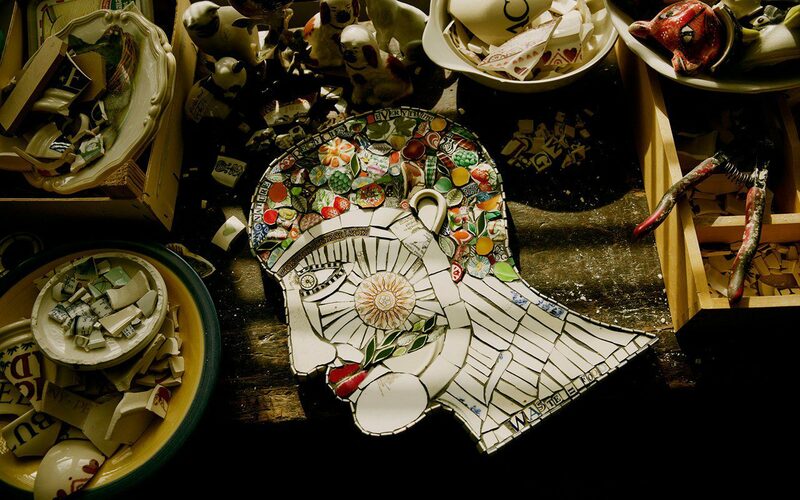 The pieces are figurative and tell a story. I often have dark tales to tell, but with twists of humour, layers and details hidden beneath the surfaces. You made a research trip to Japan a few years ago. What did this bring to your work ? 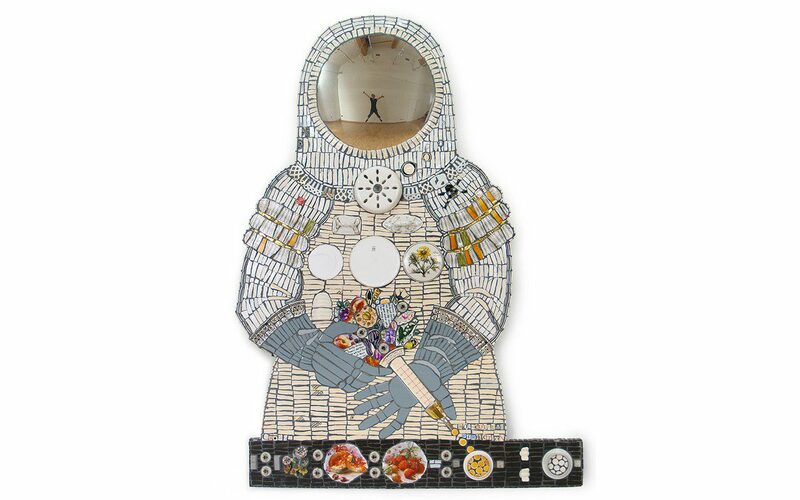 As a family we went to Japan for 4 weeks as my husband Matthew Harris (also an artist) and I were due to create a joint touring show called 50/50 starting at The Victoria Art Gallery in Bath. It was a fantastic experience, and refreshing to develop new work purely from visual information. 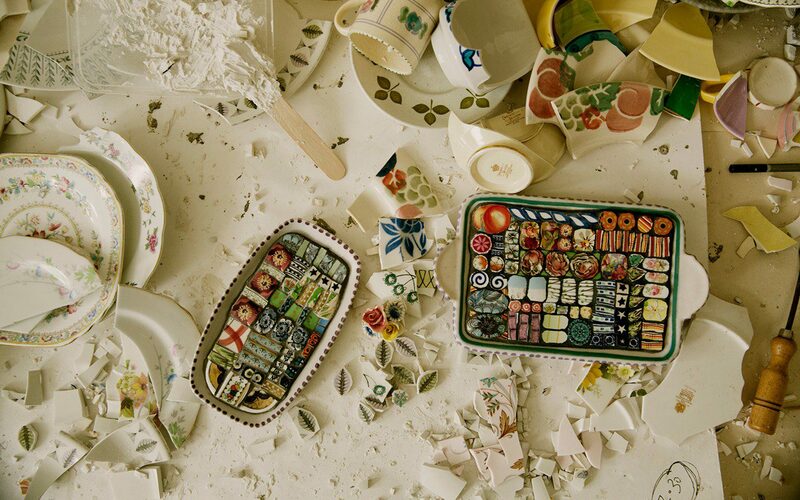 We were inspired by very different things, but both of our work is constructed from fragments. We incorporated our research and inspirations. 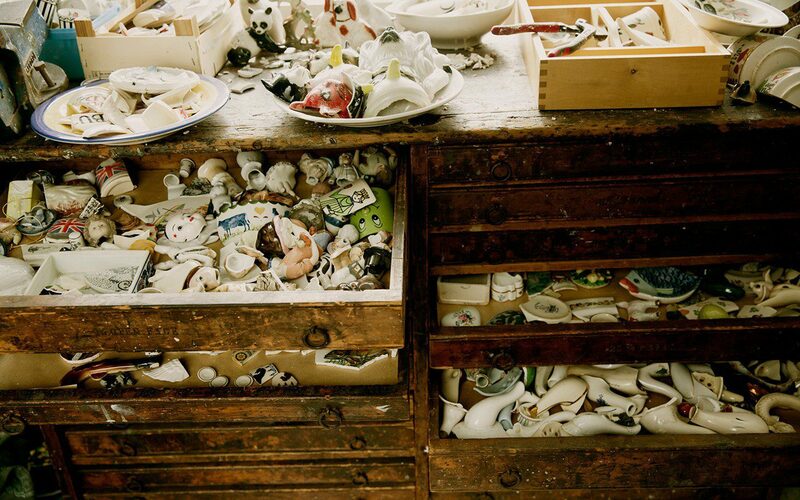 In the final exhibition, which unified the work, we had cabinets of sketchbooks, objects and photographs. We visited many of the moss gardens and temples as well as contemporary art and cultural sights. It was from Japan that I developed my interest in Kawaii and Japanese spirit creatures which include such unusual characters as fire-breathing chicken monsters, a red hand dangling from a tree, the spirit who licks the untidy bathroom and other inanimate objects that come to life. Harajuku Fruit Branch with Blossom and Chrysanths, 2011. Outlaws – Wanted Dead or Alive, 2016. Photographs courtesy Cleo Mussi. 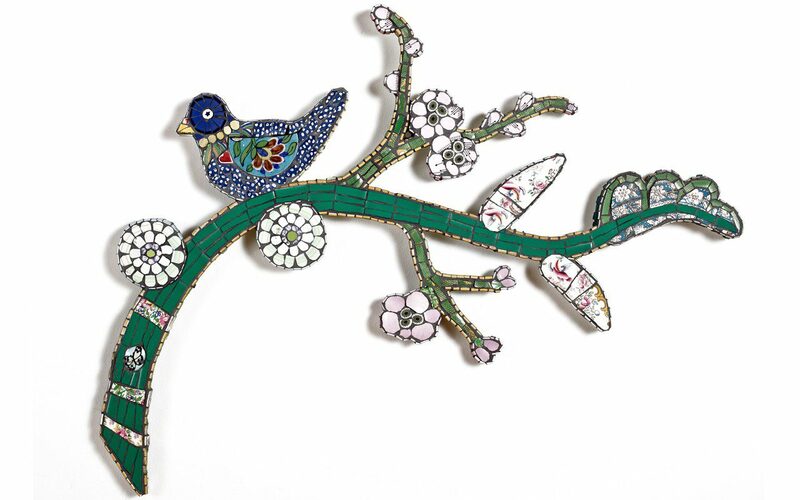 Your work clearly engages with the history of mosaic craft as a means of storytelling. It also appears to increasingly be concerned with political or social themes. I think of myself as a modern day folk artist. 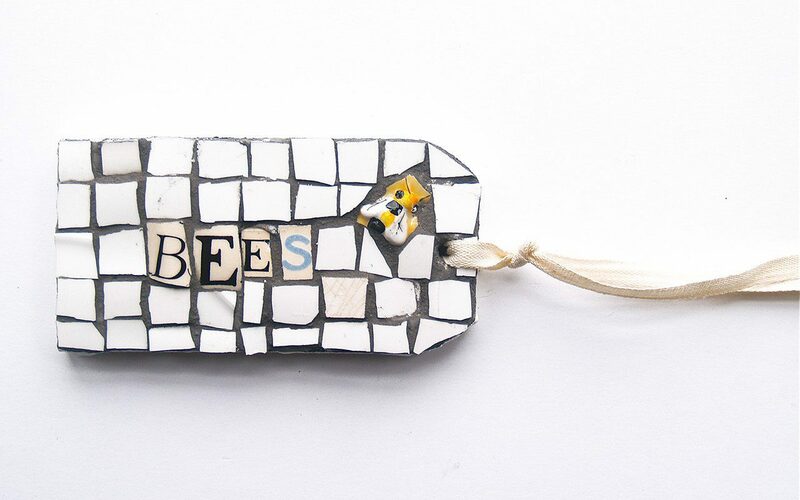 In the traditional sense of Folk Art my work reflects the world that we live in whilst connecting to bygone days. The mosaic technique is simple, but the content has depth. The work can be read on many levels and I often touch on word play and double meaning. The work on one level is purely decorative celebrating colour form and pattern and, alternatively, on another level has a political content. 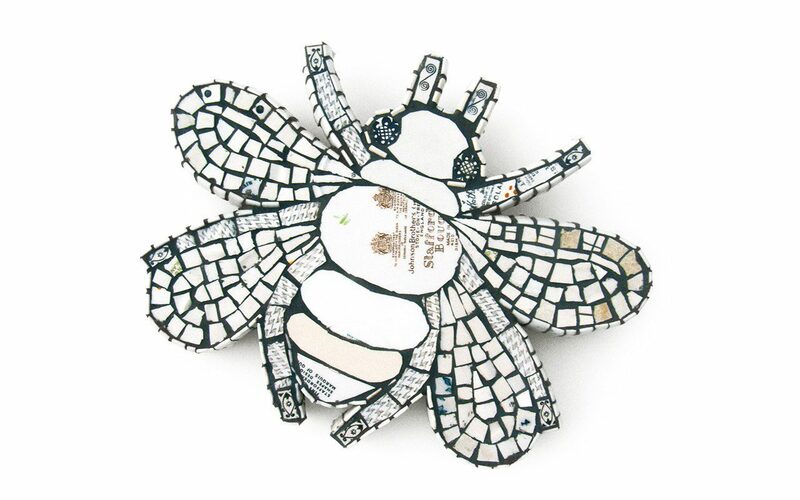 Bombus Spiritus Johnson Brothers, 2015. Photographs courtesy Cleo Mussi. I am creating a new touring show which I hope to take to London as well as nationwide. The ideas are in their infancy, but I am looking at how weeds have evolved and the relationship between them and man’s migration and establishment of agricultural settlements. I am interested in the symbiotic relationship that we have with plants and the delicate balance of what we ingest as cure or poison and what we cultivate as food or weed. I love the colloquial names ‘Bunny Up The Wall’ (Ivy-leaved toadflax), ‘Bomb Weed’ (Rosebay willow herb), ‘Jack Jump About’ (Ground elder), ‘Kiss Me Over The Garden Gate’ (Pansy), ‘Summer Farewell’ (Ragwort) and all the Devils; claws, blanket, tongue, fingers, etc. Many of these weeds were migrants, and yet they define our landscape. I am intrigued by this language that comes from the people who worked the land, often describing the plants and ‘weeds’ in terms of endearment or loathing from their working days; knowledge passed down by example and word of mouth. What do you find to be the challenges and differences between self-generated work and commissions ? Time is always the master, and the work is very time-hungry to physically create. I constantly alternate between making work that people would like to live with and thus support the creation of the more challenging pieces. I alternate between smaller works, which I make in series, and the large one-off exhibition pieces that can take weeks to make. I love to take on new large commissions as these often bring new ideas into the mix that I may otherwise not discover. 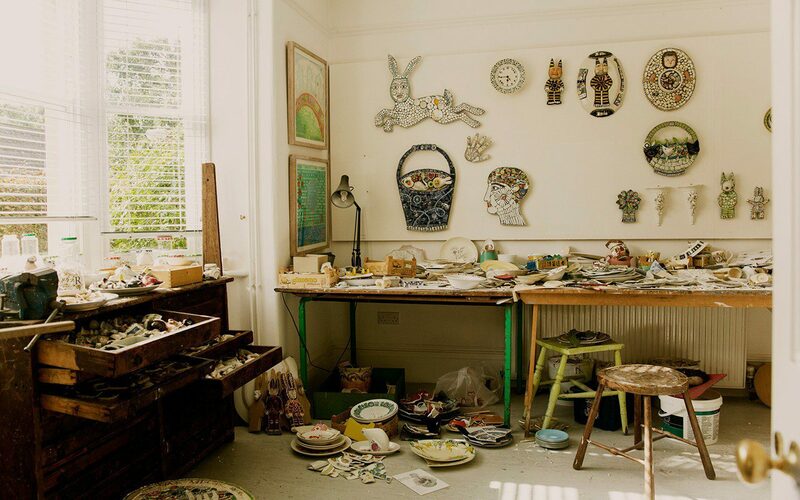 Recent joys were a Donkey with Baskets for Vale Community Hospital in Dursley, a giant magic cat inspired by Edward Bawden, a piece about education called ‘Ode To Ed’ at Prema Arts in Uley and a Solar Panel Installation Worker for Primrose Solar in London. Pretty diverse. 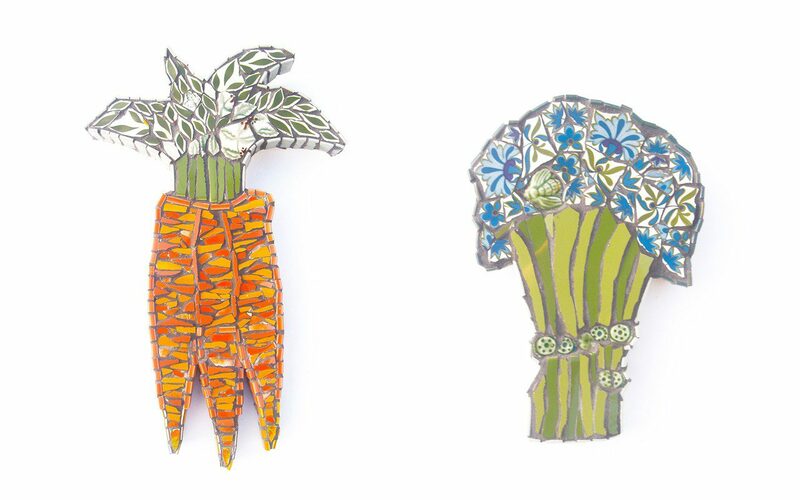 Carrots (left) and Broccoli with Dots (right), 2014. Photographs courtesy Cleo Mussi. Can you tell me about your role in The Walled Garden at The Museum in the Park in Stroud ? ‘Patron of The Walled Garden’. I am rather pleased with my new title. I have been asked to create a planting scheme on a shoe-string budget for this special space. The garden is about a third of an acre and is managed by teams of volunteers. Essentially the back garden is open at The Museum in The Park. It was untouched for over 50 years and it has now been given a new life as a place for education, contemplation and creativity for the community. Since 2008 numerous volunteers have contributed time and knowledge to this space. Starting with secret artist donations to raise funds and teams of people excavating and clearing, sifting, weeding planting and now watering. The hard landscaping and education space was commissioned and completed last year and now it’s time to put the icing on the cake. So, with just a few hundred pounds, we have purchased a handful of plants and the rest, as with my own garden, have been gleaned and propagated, split and gifted to create a new garden in about 14 sections. Dan kindly donated a huge and varied selection of irises, which have been combined with a collection from Mr. Gary Middleton, so we will have quite a show this May. Bento Box, 2011. Photographs courtesy Cleo Mussi. Starting from scratch enables us to make bold decisions; not to use blanket herbicides, our weeds are ‘hand picked’. We have introduced English bluebells under the mixed hedges and a wild seed mix and snakeshead fritillaries in the newly planted orchard, rather than lawn grass. The beds are divided into sections and aptly named ‘Bobbly Border’, ‘Bonkers Border’, ‘The Hot Bed’, the ‘Red Hot Bed’ , ‘The Purple Complementary’ and the more gentle ‘White Border’ and ‘Fernery’. Being a walled garden it’s a very hot space with very little shade, so this has been both exciting and challenging and it will also be interesting to see what survives through the winter. So the garden will evolve. This is our first season and the garden has established incredibly well. I think it has a secret underground water source. We are open to the public and anyone is welcome to visit. Coming up now are species snowdrops, ‘Wasp’ being my favorite, an auricula theatre, a tulip bed for cutting (inspired by Dan) and then later -fingers crossed – a bonkers display of zinnias for bedding, as well as all the other aspects of the garden in each season.